Sean O’Kane’s piece misunderstood our argument about electric cars, and offered little to no evidence against it. Obviously, we struck a nerve. Electric cars, and Teslas in particular, are very cool, and have many passionate fans. We would all love to believe we can help the environment just by buying such an awesome piece of tech. Hearing otherwise is very difficult. Unfortunately, while the rise of EVs is an encouraging trend, the evidence shows that in many cases replacing an efficient working car with an EV like a Tesla will actually increase your carbon footprint. O’Kane’s piece presents no evidence that refutes this. In fact, behind the strong words, O’Kane affirms nearly every major point from our segment, and he argues against points we do not actually make. First, a word about about our research process: To create the piece, we and writer Gonzalo Cordova spent over a month researching the topic. We consulted with two experts: Mike Berners-Lee, a leading carbon emissions expert and author of The Burning Question, and Dale Jamieson, Professor of Environmental Studies and Philosophy at NYU and author of Reason in a Dark Time. Both experts reviewed our script. After it met their approval, it underwent a final fact check, which it passed. We’re only human, of course, and mistakes can happen, but we work very hard to ensure our show is accurate. O’Kane offers little to dispute the accuracy of our facts. Instead, he appears to have misunderstood our point. We may bear some responsibility for this; we are always working to convey our arguments more clearly. That said, we’d like to take this opportunity to set the record straight. If your car is beyond repair and you absolutely need to buy a new one, then go ahead and buy yourself a nice, small electric car, perhaps even a used one. We wish O’Kane’s piece had mentioned this. By not doing so, he mischaracterized our views. Likewise, we do not argue that “power plants are inherently dirty.” In fact, we were careful to avoid sweeping generalizations. We focused on a specific test case: a character who wants to replace his perfectly-good Prius with a brand-new Tesla in order to lower his carbon footprint. We did this not to suggest electricity is always dirty, but instead to argue against the misconception that electricity is always clean. For examples of this misconception you need look no further than marketing materials for electric cars. On Tesla’s website they say their cars have “zero emissions.” But, as Scientific American points out, that’s just not true. Tesla should say zero tailpipe emissions. As of this writing, fully 67% of the country’s electricity comes from fossil fuels, and half of that is coal. In West Virginia, it’s 94%. If you drive there, your carbon footprint would be higher with an EV than with a hybrid. This is true in nearly a quarter of all states, including Ohio, Indiana, Missouri, and Wisconsin. That “if” is a big qualifier, because while coal is a large source of electricity generation in the United States, it’s been falling for years. We’re aware “if” is a qualifier. That’s why we put it there: to qualify our statement. If the electricity is dirty, then the electric car it powers is dirty. Our segment demonstrates that, contrary to what marketing would have you believe, an EV’s carbon savings is conditional. It’s true that EVs are the cleanest cars on average, but if your goal is to lower your individual carbon footprint, you can no more rely on the average than you could use the average human height to figure out how tall you are. Specifics matter. O’Kane suggests this argument is in bad faith because our country’s coal production has declined in recent years, and because wind and solar are on the rise. To start with coal, O’Kane is right: We’ve made valuable progress. But even the most optimistic coverage is clear that coal production is down on average, not down in every individual state. States like Wyoming, North Dakota, Kansas, and, again, West Virginia, are as reliant on coal as ever. And, if President-elect Trump follows through on his promise to kill the Clean Power Plan, the coal industry could see modest growth in the coming years. It’s very unlikely coal will return to its heyday, and maybe market forces will kill it off against Trump’s best efforts, but we can’t say for certain that will happen, or when. For the present, our point stands: An EV isn’t always the cleanest option. By limiting our conclusions to what we know, today, we’re not “twisting logic.” We’re simply refusing to gamble. 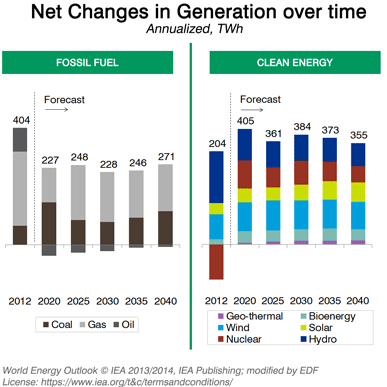 Unfortunately, the rise of wind and solar, while encouraging, is nothing to get excited about just yet. To support his claim, O’Kane links to a Bloomberg article by Tom Randall called, “Fossil Fuels Just Lost the Race Against Renewables.” This article prompted a reply from the Environmental Defense Fund, titled, “Fossil fuels haven’t lost the race, yet. Here’s the full story.” They argue Randall’s article is overly optimistic because it only focuses on capacity, not the actual amount of power we generate. Solar and wind typically generate a lower percentage of their maximum capacity, compared to fossil fuels. Think 20% to 40%, as opposed to 80% or more for coal. But the biggest problem is that, when Conover makes this crucial argument in the video, he cites a piece written by Slate’s senior technology writer Will Oremus in 2013 — a piece that’s more about the difficulty of parsing all this information than it is about how electric cars might be dirty. What’s more, Oremus spends a large chunk of his article explaining that how “clean” your electric car is will vary depending on where you live, because different parts of the country use different percentages of these fuel sources to generate electricity. We cited the Oremus piece to provide support for the line, “If those power plants burn coal, driving an electric car can actually put more CO2 into the air than a hybrid.” It’s strange that O’Kane considers this the “biggest problem,” because he does not contest the line’s accuracy. In fact, O’Kane provides additional support for this statement by linking to a US Department of Energy page you can use to compare emissions, state by state. In 12 of them, driving an EV does not result in lower emissions, compared to a hybrid. Either way, how dirty a power plant might be shouldn’t stop car companies from making electric cars, just as much as it shouldn’t stop people from buying one. It’s a problem that the companies that run the power plants need to address. We agree that energy companies ought to do more to lower their carbon emissions. We also agree that dirty power plants shouldn’t stop car companies from manufacturing electric cars. But should a dirty power plant stop someone from buying one? That depends. If you live in a state where most of the electricity comes from coal, if you already have a hybrid that runs, and if you’re considering buying the EV because you want to lower your carbon footprint — not because you want to go zero to 60 mph in 2.5 seconds — then maybe dirty electricity should give you pause. This is exactly the position that Wayne, our fictional car buyer, is in. As we explain in the video, when you buy a car you don’t need, it takes a toll. According to Berners-Lee, the embodied emissions of a car, i.e., the carbon cost of everything that went into producing it, can rival the emissions associated with driving that car over its entire lifetime. In fact, the manufacturing process for an electric car has a higher carbon cost than that of a conventional car. This is to say nothing of the unique environmental impact of mining the rare metals used in those giant batteries. This “carbon footprint” argument is a more salient point than his first one, but it doesn’t just apply to electric cars — it applies to all products. If this is the point Conover really wanted to make with his video, then he should have just focused on carbon footprints in the first place. This was indeed our intent. We use electric cars as an example of the larger problem. Was it wrong for us to make an example of electric cars, or Tesla specifically? They’re certainly not alone, and companies like Tesla deserve credit for being more mindful of their environmental impact than most. But Tesla is a potent symbol. It’s telling that O’Kane wraps up his response with a link to an article titled, “How Tesla Will Change the World.” More than any other brand, Tesla exemplifies the promise that we can solve the climate crisis with individual consumer choices that happen to feel great and involve zero sacrifice. We disagree with this outlook. When you buy anything at all, including green products, there is an environmental cost. And while we’re glad that O’Kane agrees on this point, it’s a fact that should comfort no one. In the third act of the episode (unfortunately not available on YouTube), we explore exactly this harsh truth. When you start to think of the world in terms of an interconnected, infinitely-complex web of carbon emissions, you soon realize how vast the problem really is. Our civilization is organized root to branch around the burning of fossil fuels. We ought to do our best as individuals, but we need to accept that individual consumer choices alone will never be enough. As Adam says in the segment’s wrapup, “We can’t shop our way out of this.” To really slow climate change, we need to consume less, and our governments and institutions need to work together to create broad change. You may have noticed that neither expert we used for this episode is a climatologist. Berners-Lee and Jamieson specialize in answering questions about what humans should do, given the reality of climate change. There’s a scientific consensus that climate change is happening, and that it’s caused by humans, so we wanted to take that reality as given, too. It’s worth noting that we and O’Kane agree about that reality, and that we must act. The only question is how. This, to us, feels like a sign of genuine progress in the debate. For that we’re thankful. Adam Conover is the host and creator of Adam Ruins Everything. Peter Miller is a story producer and researcher. Everything you didn’t want to need to know. Catch up On Demand or online at http://truTV.com .